• Tree that can grow up to 15m tall. • Leaves elliptic to ovate, 4-10cm x 1.5-5cm, rounded or sub-emarginate to obtusely short acuminate at apex. The young leaves are pinkish. Old leaves turn bright red when they are about to drop off. • Flower greenish, inconspicuous. Each tree bears either male or female flowers. So when they are in bloom, the trees can look confusingly different! The flowers are wind pollinated. Flowering and Fruiting: Flowers between October and February, fruiting between January and July. The fruit capsules explode when ripe to disperse the seeds by water. The seeds have an air space within the seed coat to help them float. They don’t germinate on the parent tree. Uses: Latex causes intense skin irritation and reputedly may cause blindness if rubbed into eyes. Natives in New Guinea use the sap as an ingredient in arrow poison. The sap is also used to stun fish. The timber is soft, white, light with a fine grain and rots quickly. Nevertheless, in Bangladesh, the tree is an important source of cheap planks, matches and matchboxes, and pulp for paper. The timber is easily transported by water as it floats. It is also used as firewood and converted into charcoal. 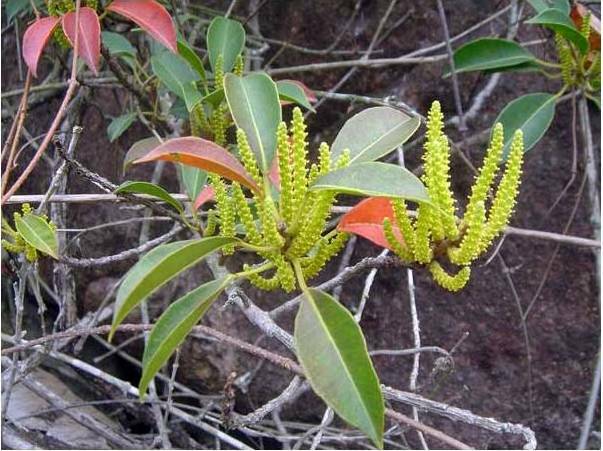 The plant is used to treat sores and stings from marine creatures. Smoke from the bark is used to treat leprosy. The plant is being tested for modern medical uses. Modern clinical trials show that the plant may have anti-HIV, anti-cancer, anti-bacterial and anti-viral properties. Habitat type: Found at or near sea level in mangrove swamps and beach thickets or along lower river courses. The tree grows further inland usually at the high water mark. It can grow in both stony and muddy ground. The tree can tolerate dry and salty conditions. It grows quickly in open areas, but can also survive in shade. Distribution: Ranges from India through to the Pacific. Also said to occur in Africa.